Bonjay are Ian "Pho" Swain and Alanna Stuart. 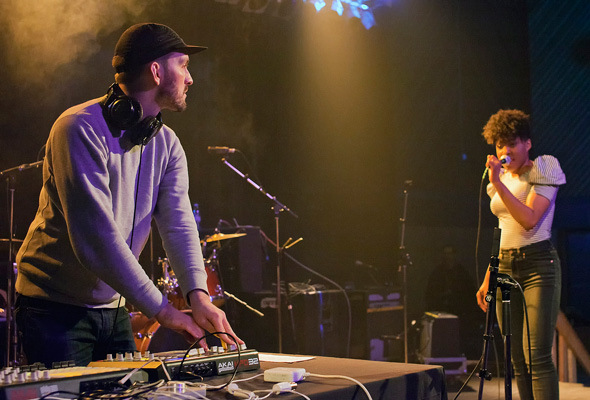 The duo formed in Ottawa but are now Toronto-based. And although their songs have been classified as dancehall and R&B, their sound roots itself in a hybrid mix - hopping from one branch of music to another - hip-hop to dance, to indie and art-rock. Bonjay's slash-and-mix style and innovative ambition makes them so enigmatic and fun to watch: You never know what you're going to get. Their debut EP Broughtupsy turned them into one of last year's breakout bands, and now they're ready to fill your ears with more bouncy tunes as they get ready to work on a new LP. In our interview, Pho and Alanna talk about their recent tour and why Bonjay sounds the way they do. How was your European tour? What are some of the highlights you took away from that experience? Alanna Stuart: We spent much of our time over there living in Berlin, starting to write our new album. I'd been there briefly before, and I was the one who wanted to go back. I had this romantic idea of going to a country where you don't speak the language, to immerse yourself in learning and creating. And it absolutely lived up to my expectations. Ian "Pho" Swain: All in all we spent two weeks in London, that was a highlight for me. I grew up listening to a lot of music from there, so it was a big deal to perform in some of the places I'd only heard about. Stuart: And Manchester! Ian doesn't drink much. It's a holdover from when he was DJing, going to school and working at the same time - he barely slept anyway so he couldn't deal with the hangovers. But in Manchester we played at this amazing former cotton mill in the middle of a housing project. The locals have turned it into a self-run art and music hub. It's phenomenal - it has the same energy you'd imagine of early-80s New York. Actually ChloĂÂŤ Sevigny was there, appropriately. Anyway, the Manchester show was a great one. People insisted on buying us drinks and because I have to protect my voice on tour, I passed mine on to Ian. He tried to be gracious by drinking them all but after a couple hours he was loopy and barely coherent - like a giant baby. At the end of the night we wanted to help ward off a hangover by feeding him Tylenols. But he was so drunk that he went to sleep chewing them like gum. Nom nom nom. . .
Can you describe Bonjay's sound? And how do you guys express this sound in the live setting? Pho: The UK press called us "leftfield pop" and we're okay with that. It's nice and broad so it gives us the freedom to take the music in different directions. Stuart: When we write the songs it's more like composing for an orchestra than writing with a band - the two of us write all the instrumentation and vocal parts, then arrange and sculpt them until they're just right. I say orchestra because some songs have well over fifty parts! In that sense we're not writing for a small ensemble. But live there's just the two of us and increasingly our drummer, Kieran (Adamas), so we get to reinvent each song for live performance. Pho: I still control a lot of the individual tracks and dub them out sound system-style, but each show we pull out different parts to play live. I think after the album is done we'll take it further and bring more of the keyboards and other gear out on the road. I come from deejaying but I play a bunch of instruments so I'll start to show more of that side. You can hear so many influences when you listen to one of your tracks, like "Want A Gang". Your hybrid sound seems like more than just dancehall meets funk and soul. Were you always interested in experimenting or in trying to create a new musical style? Pho: I think it reflects our two backgrounds. Alanna grew up singing in the church and listening to dancehall and R&B, but when she went away to university she started singing back-up for rock people like Peter Elkas and Matt Mays, and she's really into weird female pop like Little Scream and Kate Bush. I grew up listening to dancehall and UK dance music and rap. So Bonjay has us meeting somewhere in the middle. Stuart: I think the diversity on the great soul music records is a guide for us too. In the sense that - if you listen to a great James Brown record or a Stevie Wonder album, they have dancefloor tunes, they have ballads, they have all sorts of things in between. Right now, our music draws on dancehall reggae and futuristic R&B, and the songs aim to move beyond the traditional topics of soul music. But like those great soul records we want to work across the full gamut of human emotions. Pho: Toronto has had a big influence on us, too. It was only when we came here that we started to develop an original sound. From DJing I discovered that dancehall was a unifying force in Toronto - whether it's a crowd of West Indians or a Portuguese soccer team or a Parkdale bar, dancehall is how you start the dance without going pop. I went to an Indian wedding last year and half the music was dancehall with dhol drums and Hindi lyrics on top. The first time I heard a lesbian DJ play "Boom Bye-Bye" it blew my mind - only in Toronto would you find several queer dance parties all based around dancehall and soca. Your music is also very organic, despite the heavy bass and kick-drums. Songs like "Stumble" and "Gimme Gimme" not only sound good on the dance floor, they're also somehow intellectually expressed. How does being in Bonjay free you to express yourselves? Stuart: That probably comes from our personalities. There's a lot of hype and energy there, but that's really only one aspect of what we do. We live in an era when so much of our lives are openly shared, so it's difficult to maintain a public personality different from your real personality. It's a transparent age. I don't think I could pose as a shotta when I used to work at U of T. And the music shows both sides. Pho: Until a few months ago I worked as a researcher at U of T in the social sciences - I have a pretty analytical approach to things. I hadn't thought about it 'til now, but I guess music is a way of sharing some emotions I would never really talk about. "Bonjay" is a Grenadian slang for "good god!" - a cheer of excitement. What can fans get excited about with the new LP you're working on? Pho: This is our first album, so it's a chance to take some of the sonic ideas of the EP further. The loose theme is the way we live in cities today. Stuart: We have a song in the new Irvine Welsh movie - so that's a bit of a teaser. Well for about 9 seconds anyway. . .
And what about your next show at Summerworks? What can fans expect from you then? Pho: We're playing with Kieran, our new live drummer. We did a couple shows with him in Toronto before we left, but things started to gel at the shows in Europe. We still have a lot of room to grow but we're starting to feel more comfortable as a live band now. Stuart: I'm still riding the high of some of the UK shows. In the UK, there wasn't any of the self-conscious feeling I sometimes get when we're performing in a new city. I felt really understood - Toronto and London have such similar cultural histories. Coming back to Summerworks will be that and more. We're home, we're stronger performers because of touring and we're energized. We're never fully satisfied with a show but I think it will be a lot of fun to return home. Your music is always bright and upbeat. How does this reflect where you guys are right now as artists? And what's in Bonjay's near future? Stuart: It feels weird to hear our music described as bright and upbeat! I always think of my contributions as pretty melancholy - sometimes to our detriment. In high school I had a bad experience as a pop R&B singer so now I'm always self-conscious about whether something I've written is too poppy. I think we're still learning to find the right balance between our differences as artists. Beyond that, I don't want to analyze or over-think it. Being in a band is really about trying to write great songs. It's as simple as that. Pho: We're finishing up writing our first LP right now - it comes out sometime in 2012. Catch Bonjay at Summerworks Festival on August 6th at The Lower Ossington Theatre (100A Ossington Avenue). Visit the Bonjay website for more information about their upcoming shows and music releases.